Enjoy best, short, cute, cool, Dabang status for Whatsapp, facebook, girlfriend, boyfriend. Get new, unique, Dabang status in Hindi, English. Only latest, dabang quotes, messages in Hindi, English. If you think you are dabang and like to share dabang status then enjoy sharing our short, cute dabang status in Hindi but written in English font. Can read: Best Tapori status for Whatsapp, Facebook in Hindi, English. Safal hon log to dabang aadmi bhi jeb mein rakhta hai. Hamare hunnar ko har koi salam karta hai, Darane ka hunnar hi hai jo kaam ata hai. Hum dabang nahi ki tujhe be maut marenge, Tujhe to hum apna status or photo badal badal ke marenge. Hume darane ki koshish naa kar, hum marne se nahi pyar se darte hain. Jindagi mein log dukh hi dete hain, isi liye hum dukh dene mein samaj sewa karte hain. Dabang ki dabangai to dekho – Bahar sher hai bas patni ke aage dher hai. Hamare majak ka naa bura maan, hum majak majak mein hi jaan le lete hain. Non-veg to hum bahut khate hain, machli jaal mein ho yaa dil mein phansa lete hain. Hum to hamare bura chahne walon ko bhi dil mein jagah de dete hain, nahi ho pasand unhe to jameen mein hi mila dete hain. Mujhse nafrat karne wale bhi bhool jaate hain, hum dil mein naa sahi, par dimaag mein reh jaate hain. Hamare mood ka sawal hai, achcha to sab achcha nahi to bas katle aam hai. Hame pehchanne wale log aukat mein aate hain, nahi pehchanne walon ki aukat hum batate hain. In case, you want dabang quotes in Hindi then enjoy our cute, funny and lovely collection and let your friends also enjoy it. 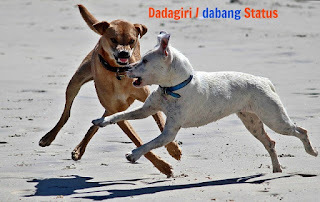 Can read: Best collection of Dadagiri status for Whatsapp, Facebook in Hindi, English. We have just covered the best of Dabang status for Whatsapp in Hindi, English. If you really liked our dabang quotes in Hindi then share it with friends on social sites. Can read: Most popular Jaat status for Whatsapp, Facebook in Hindi, English. In case, you have any query or suggestions than write to us or like us on Facebook to motivate our writer's team to write more innovative status like Dabang status in Hindi. Enjoy our updated and cool Hindi Status for Whatsapp.